The three-day Asian Parliamentary Assembly of Standing Committee Meeting on Social and Cultural Affairs begins from today in Thimphu. Over a hundred high level delegates from 20 countries will exchange experiences and knowledge in terms of preserving and promoting cultures and pass resolutions that will be implemented by the member countries. 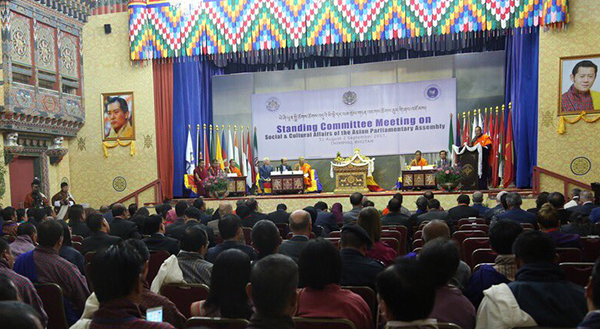 In his keynote address to the participants, which include parliamentarians, Prime Minister Dasho Tshering Tobgay said hosting such a high level meeting in Bhutan would help the participating countries understand and respect the cultures that are unique to each country. The Prime Minister said that Bhutan, with its rich culture and traditional values, has great potential to motivate and encourage member countries to work closely in safeguarding the sacred cultures. “The gathering which will discuss measures on protecting cultural diversity and cultural heritage in Asia, amongst others, I should say, is very apt. “I say this because we take pride in our cultural heritage, both tangible and intangible, that has been the basis of our identity as a sovereign nation. Lyonchhen said the meeting will not only create a forum to witness and understand the cultural aspects of the member countries, but also contribute regional cooperation, peace and harmony, and the right to development as well as social, cultural and environmental rights of the people in Asia. “I am sure that each member country will have unique and successful stories of their Constitution. “I hope the Assembly will provide an excellent forum for sharing great ideas and experiences, from which we can learn become wiser to foster bonds between our parliamentarians and countries,” said the Prime Minister. In next two days, the delegates will discuss on the nine draft resolutions for consideration. These include discussions on promotion of cultural diversity and protection of cultural heritage in Asia; collaboration on health equity; protection and promotion of the rights of migrant workers; Asian parliamentarians against corruption; effective cooperation in combating illicit drug trafficking in Asia; and promoting inter-faith dialogue and harmony among world religions. This is the first time the Parliament of Bhutan is hosting the Asian Parliamentary Assembly after becoming a member in 2006.